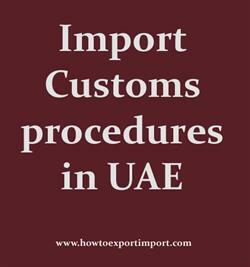 The information provided here details on how to import goods to UAE especially import customs clearance procedures in UAE. Who are the parties involved in import customs clearance formalities in UAE? What is the customs process in UAE to import? How is import cargo released from UAE Customs to importer? Import cargo clearance in UAE Customs. United Arab Emirates Federal Customs Authority (FCA) is the official customs authority of Emirates. Local customs departments do the executive work and draw the customs policies for each emirate in compliance with the GCC Common Customs Law. The UAE has topped the world in the Efficiency of Customs Procedures Index as per the Global Competitiveness Yearbook 2017 published by IMD World Competitiveness Center. The UAE is very strict in dealing with the import of banned items and the illegal import of restricted items into the UAE. Import customs procedures required in ABU DHABI . Import Customs process in DUBAI. Process to import to FUJAIRAH . Requirements of customs to import to JEBEL ALI . Customs requirements in DHOR AL FAKKANto import. Customs needed to import to JEBEL ALI . How can I clear customs to import in FUJAIRAH . What Customs formalities required to import in ABU DHABI . What should I do to import goods in DUBAI. How to get import customs permission in KHORFAKKAN. Procedure to get customs clearance to import in FUJAIRAH . Mandatory process need to complete import in DUBAIThe way to get customs clearance process to import in ABU DHABI .